« Will a KitchenAid mixer from America work in Europe? For those of you wondering what the difference between ‘sorbet’ and ‘sherbet’ is, a sorbet has no dairy or eggs in it, and sherbet is usually made with milk or egg whites. Of course, there’s those rogues out there adding a bit of cream or whatever, but that’s the story on that and any variations aren’t authorized by me. And as you know, the ice cream (and sherbet) buck stops here. If you’re avoiding milk, you could use a non-dairy alternative, such as rice, coconut, almond, or soy milk. 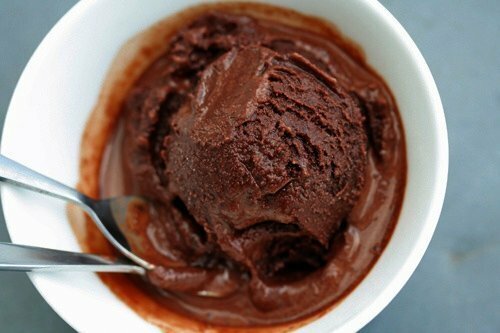 Or if you prefer, you can replace the milk with water to make Chocolate Sorbet. I’m a big fan of full-flavored sherbets such as this, because it’s much more refreshing in the summer than a full-on scoop of Chocolate Ice Cream. I refer to scoops this size as “European-style”—since it’s so intense, one modest scoop is big enough on flavor to satisfy my craving for chocolate. And anyone whose walked away from Berthillon in Paris, wondering if they really meant to to you that much (or actually, that little) sorbet or ice cream, one lick is usually all it takes to realize that it’s enough. Another reason I’m particularly-interested in lighter fare right now is that I just bought a couple of pairs of pants at les soldes (the sales) this week and no matter how much tugging and yanking I did, I realized that I had to do at the French department store, Men’s-Department Walk of Shame, and go from the dressing room back to the rack, to grab the next size. Yes, looking good is extremely important here, but to me, breathing isn’t optional. While I’m confident that the two pairs that didn’t quite fit were both mis-marked, I’m taking a breather from rich desserts for awhile. But I’m not ready to give up chocolate. Let’s not get that crazy. Okay. Deborah Kwan just gave me a box of Valrhona cocoa powder that I’ve been wondering what to do with. I’m going to give this a shot. P.S. So is a yogurt sorbet still a sorbet, or is it really a sherbet? Hi Michael: If it’s made with soy yogurt, it’s technically a sorbet. If it’s made with dairy, it’s a sherbet. But since Yogurt “Sherbet” sounds funny, (or like the French say, “C’est pas jolie”, “It’s not beautiful”…which is used to justify quirks in the language), sorbet seems to be frequently-used. Have printed this out and will give it a go with some Callebaut Dutch Process cocoa. I have to say, though, that we’re still in chocolate overload from the hot chocolate recipe in The Sweet Life. I now start each morning with a demitasse of hot chocolate – I tell myself it’s a restorative tonic. I tried to convince myself it was a complete breakfast (a little dairy, a little dark chocolate, a bit of protein), but my stomach refuses to be persuaded. Add that to the 70% “Ironic Freddos” we’ve been making (using the tempering technique from The Great Book of Chocolate) and there aren’t really many calories left in the day for non-chocolate food groups. Mmmmmm, perfect for this warm weather. Summer is finally here! Good luck with your visa stuff, they do everything they can to discourage you and wear you down (like changing the list of documents you need to bring at the last minute – surprise! ), but it’s worth it … I would think you might be able to apply for a carte de résident some time soon (usually after three consecutive years of one-year visas)? But alas, no ice cream maker here (with the right voltage that is) to actually play. Another recipe of yours for the To Make list that’s just not happening….. yet. Zut. interresting ! I did not know that there was three names for sorbet/sherbet/ice cream food. I only remember two in french : sorbet (no cream, no dairy, especially fruit-y preparations), and ice cream (with any dairy, even when there’s also some fruits). Do you know if the name sherbet or something close exists in french too ? about the quirks in the language, this is pretty close but if I may : what’s told to children is to recognize if “ça fait beau“, ou “ça ne fait pas beau“. C’est pas joli is more often used to say that the words aren’t pretty at all :) (sh*it, what the f*ck etc). for example, a mother would say to her child working on the french lessons : look at what you wrote here, une voiturre with two r, ça ne fait pas beau !. And then if the boy says “ah oui, merde !“, she would promptly say “hey, don’t tell this kind of words ! c’est pas joli ! ” :D.
you’ve probably seen it already. it’s supposed to be intensely chocolatey. have you used it before? Hi Adrian: When I was at their chocolate school, we did use the Coeur de Guanaja. It’s a specially-formulated chocolate and they developed certain recipes to use it in. (They told me it’s not interchangable with other high-percentage chocolates, due to it’s formulation.) It was very intense…and good! Krysalia: I’m not one to argue with a French person–although I’m not bad at I’m getting better at it ; ) but Romain always says “pas jolie” when I bring up language irregularities. Luckily I’ve never said anything pas jolie, although I have said a few things that were pas beau. Thank you for posting this David! It’s plenty hot in France in the summer, correct? I say fiind a pair of stretchy shorts and eat what you want. Save the pants for fall! Have you tried the chocolate from the Grenada Chocolate Company? It’s organically grown on the island of Grenada in the Caribbean and their dark chocolate bars are superb. I’m in love with the 71% bittersweet bar and I’ve found out from their website that they produce a cocoa powder that I’m dying to try. It’s as good as any chocolate I’ve ever tasted. And sustainably grown and produced to boot. Definitely worth searching out. david> ah ! I’m sure that romain says it like you said. it’s probably some regional differences. “ça ne fait pas beau” is what I was told at school here in the north, and what I used to say to my students. I’ve always thought it as a general way to say (confirmed by the fact I know some people from other regions who were told the same) but in france there’s always slight twists in the language in a place or another, that coexist. but about sherbet, if I may, do you know if there’s such a way to sort ice creams in france, of if we have here only sorbet and crème glacée ? And of course in British English, sherbet is flavoured, fizzy powdered sugar! Thank you for another delicious and straightforward recipe. This is perfect for the hot and humid weather we have in Santiago (DR). I am going to try it, although I don’t have an ice cream maker/machine. But I found your older post how to make ice cream without one. I also wanted to let you know I made mini chocolate yoghurt cakes over the weekend, and my husband kept saying “wow, …wow, …wow, …wow….” Thanks a lot for helping me to shine ;-) Although I found the recipe on Deb’s Smitten Kitchen, I am planning to buy your new book when I am in the US in August. Congratulations to your new book! I hope the Signing was fun on Saturday. I love your posts and always crack myself reading your Twitter. Oh oooooo ahhhh. 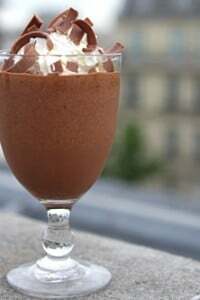 Frozen chocolate goodness for breakfast is what I am now craving! If I keep stopping by I am soon going to have to do the department store walk of shame. So while it is 11:00 a.m. on a Monday morning after a multiple-celebration/indulgent barbecue weekend, as this has no cream I’m considering it good for me. And therefore a totally-necessary thing to make today. It’s for my health. Thanks for the official chocolate sherbet recipe! 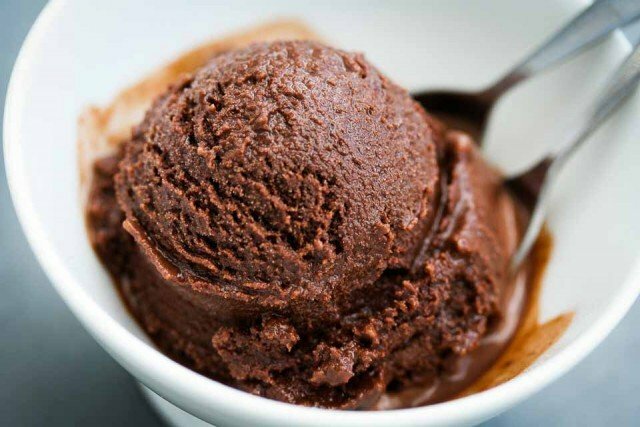 I’ve been substituting a cup of milk for a cup of the water in your Perfect Scoop chocolate sorbet recipe. I make it with Valrhona cocoa and Trader Joe’s bittersweet Pound Plus chocolate. It’s my current favorite, with your Buttermilk Lemon Sherbet (made with Meyer lemons) a close second. I made this recipe (I think it is the same one as in The Perfect Scoop) a month ago and it disappeared instantly when surprise guests stopped by. It was simple and so delicious! We served it in cappucino cups with additional chocolate liqueur drizzled over the sherbet, topped with a little whipped cream and dusted with chocolate powder for a faux cappucino look. Wonderful recipe! I am all over this recipe. It is going to be just the thing with this hot weather we are having. I am going to trying it with rice milk, I’ll let you know how it turns out. Ah yes, the dressing room “walk of shame”. I know it well. I think that means it’s time for me to start fitting chocolate sorbet into my dessert repertoire. Haha.. loved this post! what a nice treat for summer.. and I am sure you look fabulous in any size jeans, David! This looks great. I almost prefer iced cream without eggs..and this looks like some of the ice cream recipes I’ve seen. Maybe those recipe contributors were just in denial (intentionally or otherwise) that it was really sherbert so they wouldn’t feel deprived? Whatever. I’d like to make a sorbet out of your best chocolate sauce! Oh, baby! If a person does not have an ice cream maker – can this be made the old fashioned way – by hand? I am also feelin the love of ice cream after my weekend indulgence into White Chocolate Ginger. Excellent. Well it was over 100 degrees here. Can you blame me? Perfect timing, I was just asked to make some home-made ice cream for 4th of July…I think sherbet will be close enough. For those of you who’ve asked, there is a link I posted at the end of the recipe to a post I did called Making Ice Cream Without a Machine which explains how to do it. Just made it too -so easy and super delicious (as the 7 yr old son said). Perfect for swelting Paris afternoon. Merci for the recette. The airs have been shimmering upwards of 100 F hereabouts so this is a welcome sight for me whose A/C went out last week. Will try to summon the strength to haul myself up from this pool of sweat to try it. Yay! Just yesterday someone asked me what the difference was between the two, and I answered the same way as you did. I feel like a rockstar! I know, it’s a bit over the top, but you have written a stellar ice cream book. The sherbet looks delicious and it is next on my list of recipes with which to torture my ice cream maker. I’ve never had chocolate sherbet. Thanks to you I will remedy that asap. Recipe Question – Can I substitute a small shot of espresso for the Kahlua? I would omit it like you suggested but I don’t want to lose out on the intensity of flavor or the improved texture you mentioned. I’m just not a fan of coffee flavored liquor. About Berthillon, it’s not the size of the scoop that upsets me. It’s a perfectly reasonable portion. A far cry more sensible and enjoyable than the monster size ice cream scoops and treats for sale in the States. When I was a kid we often vacationed in Florida. In a town nearby there was an Old Fashioned Ice Cream Shoppe, Jaxson’s I think, it was a LONG time ago. As a five year old I was thrilled to see the scoops there were larger than my head. No joke, a two scoop cone was too heavy to hold in my youthful sun browned hands. And the multi scoop sundaes were served in giant dishes. There were sizzling sparklers and pitchers of hot fudge and caramel too! Perhaps the origin of “supersizing”? Back to Berthillon, the problem that I always encounter at Berthillon is that I don’t live nearby :-) Once I have waited patiently in line, unlike a true Parisian I now know for certain from your delightful book, I finally reach the coveted ice cream and sorbets and I am expected to make a singular selection? It’s like Sophie’s Choice for me in there!!! And since I am usually only in Paris every few years for a week or so, making a single selection seems beyond cruel. So call me a vulgar greedy American, but when I walk out of Berthillon I have two cones in my more mature / less sun kissed hands. And since they are perfectly petite I can hold both cones very well as I luxuriate in their excellence. Wild Strawberry, Chocolate w/ Nougat, Pistachio, Raspberry Sorbet, Mandarin Sorbet, Peach Sorbet, Slated Buttered Caramel Glacee etc….. imagine living back in SF with very limited access to Berthillon. What would you do? Maybe not you, because you make your own amazing ice cream on a regular basis ;-) But me, I’m no Meryl Streep. I simply cannot choose just one. I believe you like setting yourself up:). For us sherbet is just a fresh juice but I would take your version any time! I will try this with soymilk combined with cashews and get back. Thanks! Mmmm this sounds delicious and so much more appetizing at the moment than ice cream (I can’t believe I just said that ::gasp::) I have been transformed into a lover of dark chocolate thanks to reading you The Great Book of Chocolate and I think I will make this with the Guittard cocoa powder I just got and my new favorite Lindt’s 90% Excellence bar. I was so surprised how subtle and mild this bar was for having such a high chocolate content but it is delicious! And I thank you, again, for informing me in The Great Book of Chocolate that it is Guittard that supplies See’s with their chocolate. Eating one of the bars I just bought was so nostalgic for me! Great pictures; the last one is particularly decadent… Now knowing the difference between sorbet and sherbet, I will go to bed less “bête” tonight; thanks, David. This sounds so good. I love that the the chocolate isn’t diluted with cream or eggs. Will have to try this one soon. By the way, I was gifted a tub of Kinako Ice Cream and it is fantastic. It’s great on it’s own but even better as a sundae with red bean paste and matcha powder on top. I’ve also been eating with crème de marrons swirled in. Marc: Glad you liked the one! I had to toss that in since it’s so interesting. Sarah: Yes, it’s hard to figure out what to get at Berthillon. But in truth, by the time it’s my turn to order, I invariably get the same thing every time: glace caramel (regular caramel, not their salted butter caramel, which tastes odd to me) and chocolat. My pal Olivier wrote a pretty funny piece, giving a Parisians eye view of Berthillon. And yes, you could use espresso. The alcohol in the Kahluà gives the sherbet a slightly-better texture, but it’s fine to omit it, or use something else in its place. Maryann: Sounds good. The only thing I might be concerned with is that high-percentage chocolate like that can be grainy. So be sure to blend it well to ensure the mixture is smooth. beautiful pictures! these make me crave for a cold chocolate dessert! thanx for clarifying the difference between sorbet and sherbet! i wouldnt have known! hahaha! Wow! That looks so rich. I just grabbed some coconut water from the store on a whim. Any ice creamy ideas for it?? this is wicked stuff, david! i’ve bensdorp cocoa from callebaut, i think, and callebaut 60-40 dark chocolate in stock! Don’t forget coconut milk as a real food, non-dairy “milk”. Actually, I sort of object to the term “milk” for soy, nut, and coconut steeped liquids. They are “juice” to me, not milk. In my food book, milk comes from mammary glands, but I know I’m over-ruled by food manufacturers and public opinion on that one. However it’s called, coconut milk and coconut cream make great ice cream for those who don’t use dairy foods. I use it all the time (even though I also use dairy foods). I make my own coconut milk, too, steeping freshly grated coconut or dried unsweetened coconut in warm milk, then pressing/squeezing the liquid out. Let the liquid sit so that the lighter coconut oil rises to the top and skim that off for coconut cream, too. I also keep my ice cream mixture raw, because a) I don’t want to wait for it to cool again, and b) I prefer raw yolks sometimes. My eggs are very fresh from a local woman who raises “backyard” chickens, so I trust their safety. I love sorbet, but never make it because without much fat or protein, it sends my blood glucose level sky high, then crashing when the insulin catches up. I need a high fat content if I am going to indulge in ice cream, because of blood sugar regulation issues. So when I make ice cream – I use lots of egg, lots of fat, and a very low sugar content out of necessity. Wow. I think you are my hero. This is *seriously* tasty stuff. For what it’s worth, I used 70% cacao dark chocolate, vanilla soy milk and since I didn’t have any coffee-flavored liquor, I used vodka and added a light shake of espresso granules. I’ve now made about 8 recipes from The Perfect Scoop, but this one skyrocketed over them all to the top of the list, according to the kids and husband. Had to forcibly restrain my husband from getting seconds – I want to have more for all of us tomorrow! And while we love Berthillon, we followed your recommendation re Fenocchio, and are still dreaming of their caramel sale (assume the accent or it’s dirty) and their confiture de lait. This looks so amazing… I need to make this right now! p.s. I made your Panna Cotta this evening (first time ever trying it) and it was so phenomenal! Yum. I made the chocolate sherbet yesterday with Bensdorp cocoa powder and Cacao Barry Extra Bitter Guayaquil chocolate and used orange Curacao liqueur since I’m not fond of coffee flavor. The sherbet is like a fudgesicle with just a hint of orange to it. Most excellent. dear lord that looks good. can one make a sherbet/sorbet with carbonated water and have a fizzy sorbet/sherbet? does it work? a chocolate soda sorbet? Works wonderfully with soy milk, though I cut the sugar back a touch since the soy milk I use is slightly sweetened. Big hit with lactose-intolerant friends, and (I never thought I’d say this) I prefer this sherbet to chocolate ice cream. It’s just…more chocolatey. I think I prefer it for the same reasons I prefer dark chocolate over milk chocolate. I’ve made this ice cream and 2 persons in my family say it is not eatable, because it tastes like dark chocolate and 2 say that it is delicious, among them my 3 year old daughter that can never say no to a good dark chocolate. She is funny, all grandmas bring her milk chocolate and after she tastes it I always have to clean her tongue, it is so bleeee. But this recipe is great. I just made the base. It tastes wonderful with Cacao Barry Extra Brut and Force Noir. Can’t wait to freeze it. Do you think it would make good popsicles? I imagine an upscale Fudgsicle. I just made a batch of this in my trusty Donvier hand-crank job I got at the thrift store for $3. The sherbet was very good: nice chocolate flavor, not too rich. I was a tad worried because the batter did seem a bit grainy. Would it be a problem to put the batter in the blender right before putting it in the ice cream maker? I didn’t try it, but I’m curious. Charlie: In the recipe, in Step #4, I do advise tasting the batter and running it through the blender if it’s grainy. Some chocolates don’t melt as well as others. Julia: Yes, it would. You could reduce the sugar to 1/3 cup and/or use non-fat milk (or water) to make sure they freeze harder. Rebecca and Rachel: Thanks for reporting back and glad you liked it! Anna: I do use coconut milk in some recipes but since this has relatively small amount, you wouldn’t really get the flavor of coconut all that much. But you could definitely use it in place of the cow’s milk. I’ve just made this, using cocoa from my local Chocolate shop. I live in Belgium, so it’s veryvery nice cocoa. I used cote D’or 56% chocolate and a half spoon of powdered espresso. Amazing. Thank you for the recipe. Love the sherbet! I made a more decadent version by adding broken up pieces of your wonderful chocolate-almond buttercrunch toffee to my ice cream maker a few minutes before it was done. I know it kinda defeats the purpose of keeping things light, but oh my god what a combo! I made the goat cheese ice cream from Perfect Scoop and it’s one of my favorites now. Have you tried making it in the savory style, i.e., without sugar? I was having a “creative” (that can turn into “catastrophic”) moment and thought of serving it on top of a perfectly ripe sliced tomato with a chiffonade of basil and powdered olives (I found a recipe in a cooking magazine). I’ve eaten basil ice cream and tomato sorbet/granita, so I thought why not a savory chevre ice cream. Your thoughts? Yikes or yes? Made this last night and it was delicious! I even had a few spoonfuls for breakfast. I used cointreau instead of kahlua (which I didn’t have) and it was lovely! I made this ice cream with Soy Milk and hazelnut liquor instead of Kaluha. It was AWESOME!!! Unfortunately, it didn’t make enough. I’ll have to double the recipe because it will go FAST!!! Thanks! Made this recipe and I didn’t fail it! Phew! Randy: The problem with making that style of savory ice cream is the sugar in ice cream is necessary to keep it from freezing too hard. If you were to use something like a Pacojet, or to eat it right away, it would work. Judy: Thanks for the report. Glad to know it works with soy. Wow, that looks great! I recently have bought 3 kg of Valrhona chocolate, and I’m sure some of that will turn into that lovely sherbet. But I’m asking myself what the job of the cocoa powder is? Is it really necessary or can it be substituted by some more chocolate? Johannes: I use cocoa powder because it adds chocolate flavor, but not a lot of extra ‘weight’, so to speak. 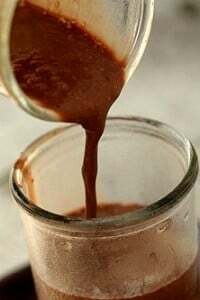 If you want to experiment, 3 tablespoons of cocoa powder is the equivalent to 1 ounce unsweetened chocolate, so perhaps you can use that as a guideline for your experiments, making adjustments for any sugar if you’re using bittersweet chocolate. I just made the base for this. May I ask, why you only heat 1/2 of the milk at first and then add the rest later? Thank you for all your wonderful recipes, David. I really have to get your ice cream book soon. Thank you, thank you David! I got your ice cream book right before my one year old was diagnosed with severe milk protein allergy. Since I tried lots of alternative soy concoctions, which were not a success. Not for the baby, for her parents of course. This sherbet recipe works very well with soy-milk but also with hazelnut- and almond-milk. What’s more I can now make the sherbets from your book also. Hi! I just wanted to tell you how much I love your recipe for chocolate sorbet (from The Perfect Scoop). I have made it twice and it is just downright decadent! Everyone that samples it asks for the recipe. Thanks for helping get me lots of raves!!!! Also, FWIW, he prefers it unblended. That slight graininess, when frozen, translates to a subtle texture that intensifies the chocolate experience–always a good thing. Now I’m going back to The Perfect Scoop to start dumping liquers into all my favorites . . .
Can the sherbet mixture get too cold before going into the freezing machine. My first batch was made with whole milk, bitter sweet chocolate, and exceptional. The second batch, a double recipe, was made with 2% milk, bittersweet and semisweet chocolate (50% each). It didn’t taste grainy so I didn’t blend it. After a 24 hour refrigeration in a metal mixing bowl it was starting to thicken up a bit – I stirred it before transferring to the machine. The final product was actually a bit grainy – I think I’ll go back to single batch with whole milk, and perhaps a bit of espresso powder for the third try. Thanks for the no egg yolk recipe. woww…., Chocolate Sherbet sounds yummy!! I think it’s a great treat for summer! I haven’t taste anything like it..too delicious to avoid!I will try this soon..
Wow, Yes, this was delicious and perfect for satisfying my need for strong chocolate flavor without eating an entire pan of brownies. One scoop was definitely enough. And now I know that I need to add booze to all my homemade ice creams to keep them scoop-able. That’s my excuse and I’m sticking to it. Just made this delicious concoction to conquer a midnight chocolate craving… wasn’t paying attention and forgot to add the cocoa powder at the beginning, so it went in with the other chocolate and the vanilla. Was still phenomenal. Thanks!! Just checking in to say that I made this and… wow. So, so, so tasty. 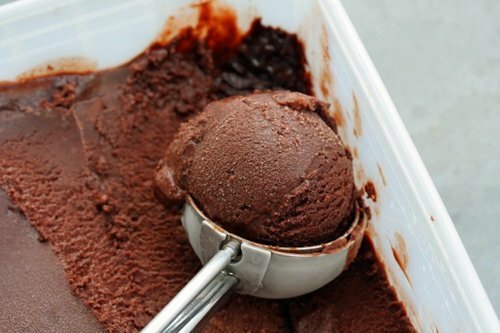 And I thought nothing could be more chocolatey and delicious than your chocolate sorbet from The Perfect Scoop. Was I ever wrong! And while I’m on the topic of how amazing the recipes from Perfect Scoop are, I’ve gotta share another story from this week. I came upon a huge quantity of mint in my grandma’s garden on Sunday. She told me to take as much of the “filthy weed” as I wanted. So I did… and it became stunningly refreshing mint ice cream with chocolate stracciatella drizzled throughout. My family and friends LOVE it! Thanks, David! I was wondering if you could give me your take on Van Houten Cocoa Powder? Have you tried it before and is it any good? Just made this – stunningly good. I used homemade spiced 151 rum instead of Kahlua, half Van Houten cocoa (coincidentally) half Black Onyx cocoa, & Valrhona Guanaja chocolate. I doubt I’ll ever make chocolate ice cream again. I made this yesterday for the second time. I used Blooker Cacao for the cocoa powder, and instead of Kahlua used Triple Sec. Absolutely stunning! David, what is the substitution for egg whites? I have now made this recipe at least a dozen times. 1 Instead of Kahlua add 2 tablespoons of triple sec. 2 Add 1 Tablespoon of finely chopped mandarin zest. (Make sure that you shave off any white pith before chopping). 3. Make sure that you use 70% cocoa solids chocolate. It is truly sensational with the mandarin flavour, which is reinforced by the triple sec. One final luxury for me is that we have a mandarin tree which produces about 200 kg of mandarins a year and the zest from a fresh picked mandarin is all the more juicy! Mon Dieu! Ok, I admit I slightly adapted this recipe, I hope you don’t mind? I had an egg white left over which I whisked up to a nice meringue-y texture and folded in at the half frozen stage, now this may have been a happy accident because the texture has come out like a frozen mousse, totally choc-eriffic. Charles: Unfortunately I can’t tell you without testing it first. 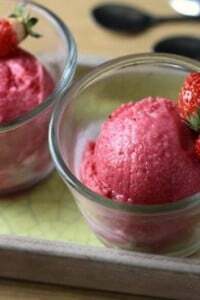 You can check out the post- Tips for Making Homemade Ice Cream Softer, for some guidelines about adding alcohol to ice cream and sorbet bases, but those are just guidelines and you may have to make some adjustments. Good luck!